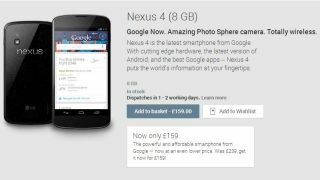 Google has slashed the price of its Nexus 4 handset, raising suspicions that it may be queuing up its rumoured successor the Nexus 5. The healthy price cut sees the 16GB LG made Nexus 4 drop from £279 ($349, AU$399) to £199 ($249, AU$299), while the 8GB version is now £159 ($199, AU$249) - down from £239 ($299, AU$349). Countries benefiting from the reduction of at least 25% are the US, UK, Australia, Canada, France Germany, Spain and Korea. Now it's certainly not out of the question that this price drop could well signal the impending arrival of the new Nexus 5, with Google keen to clear out the last of its Nexus 4 stock before the new smartphone hits shelves. Originally it was thought the Moto X could be the next Nexus device, but clearly that isn't the case after it launched earlier this month. While LG has apparently ruled itself out of the running as the manufacturer for the successor other reports suggest it's still in with a shout, plus there are rumours the now Google-owned Motorola may be the OEM of choice this time round. Recent reports peg the Nexus 5 as sporting a screen somewhere in the region of 5-inches, a powerful quad-core processor and running a completely new version of Google's operating system: Android 5.0 Key Lime Pie. In terms of a Nexus 5 release date we're still in the dark, but considering this price drop news we're hoping it'll be with us in time for Christmas.